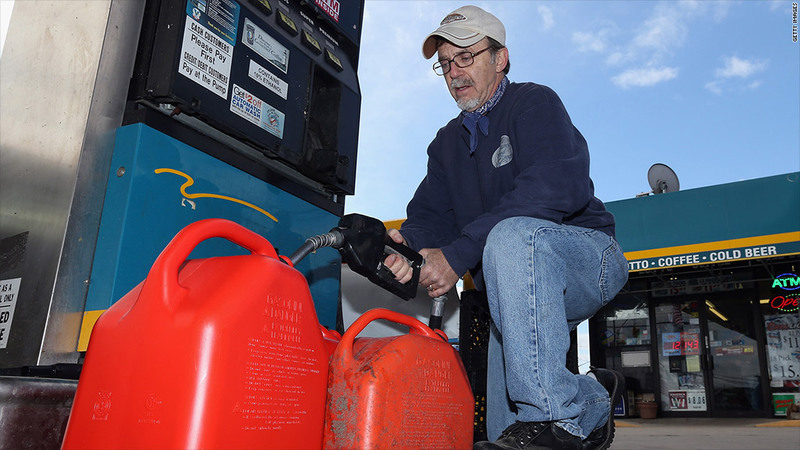 John Cerone fills his gas containers at a Valero gas station in the aftermath of Superstorm Sandy, on November 5, 2012, in Mastic, New York. Gas stations in the New York metro area are gradually coming back online, providing hope to motorists and also those who are still without power from last week's Superstorm Sandy. The U.S. Energy Information Administration said Monday that 24% of gas stations in the metro area did not have gasoline available for sale, one week after the deadly storm swept through the Northeast on Oct. 29. That's compared to 27% of gas stations that were unavailable on Sunday and 67% on Friday. Long lines of cars have become a common sight at gas stations in New York City and New Jersey. Pedestrians holding gas cans are also queuing up, seeking fuel for the generators powering their homes. Shipping problems at the ports, as well as traffic jams resulting from the loss of mass transit, have fouled up supply lines in the wake of the storm. In addition, many gas stations lost power during Sandy, and with it the ability to pump gas.